While professional welding is a lucrative and rewarding career, it also carries some inherent dangers. Welding involves the use of high temperatures and electrical current and taking proper safety measures is necessary. There is more to safety in welding than avoiding puddles of water while using high voltage welding arc or using a solid ground. Being injured on the job is not uncommon for welders and failing to protect yourself can cause long-term health risks. Fortunately, through safety training, your employees will learn how to protect themselves which will greatly reduce the number of accidents and injuries. 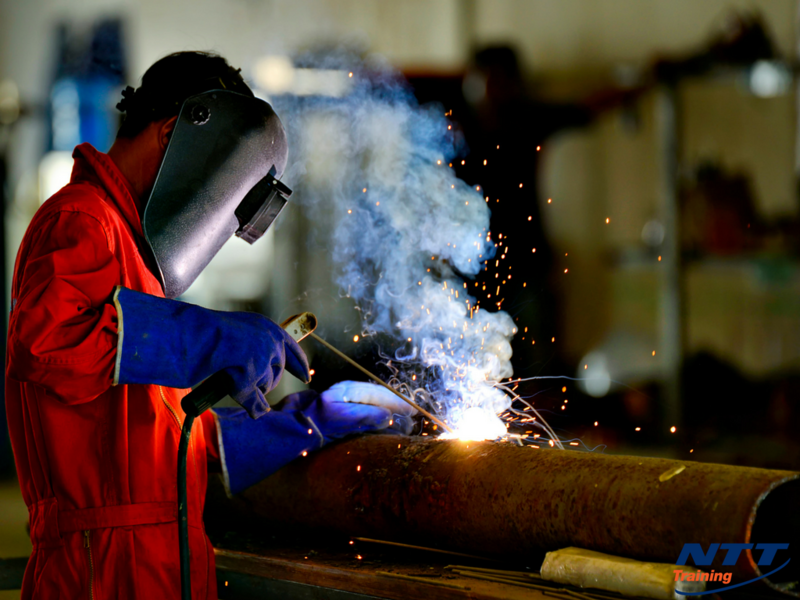 Some of the common hazards during welding are impact, penetration, smoke, harmful dust, heat, light, and fumes. Welding smoke is a mixture of fumes and other gases, and most of the substances in smoke are very toxic. The intense heat and sparks can cause severe burns. When metal chips and hot slag come into contact with eyes, they can cause injury and in severe cases lead to loss of sight. The intense light can also cause eye damage. If there are flammable materials near the welding area, the heat and sparks can cause fires and explosions. There is also the high risk of electric shock. To avoid these common safety hazards, it is important to know the necessary precautions that you should take. Below are three ways you can improve welding safety. Read and understand the instructions: A welders’ operating manual contains information on procedures that help maximize the machines potential and safety information. Ensure that all employees operating the machine are familiar with its contents. In case you lose the manual, or it gets damaged, call the manufacturer and request for a replacement. Many manufacturers post manuals online, and you can download them from their website. Wear the proper clothing: All welding jobs require proper safety clothing. From welding safety glasses to a welding helmet and gloves, there are several things that welders need before tackling welding tasks. You should never wear short-sleeved T-shirts or shorts when welding no matter how small the job. Any exposed skin is vulnerable to painful and harmful effects of infrared and ultraviolet rays. Sparks also catch in pant cuffs, open pockets or shirts that aren’t well buttoned. Therefore, always button your shirt collars and front pockets to cover your skin completely and prevent them from catching painful sparks. Additionally, never leave butane lighters or match boxes in your pockets. Breathe freely: Welding fumes are difficult to avoid, especially in industrial environments, and for this reason, you should improve the air quality for your workers. Welding fumes cause some illnesses such as lung cancer, heart disease, kidney damage, stomach disease, motor and neurological problems. Some specific materials may require respirators when welding that’s why it’s important to provide employee safety training. Both seasoned and new welders can easily get into the “comfort zone.” This is where one becomes unworried about welding safety. If you drop your guard during welding, you or your workers can be hurt, maimed, or even fatally injured. Welding safety guidelines demand that all welders are always receiving safety training and staying alert. With respect to workers’ right, the Occupations Safety and Health Act (OSHA Act) of 1970 requires all employers to provide all necessary information, training, instruction, and supervision to avoid potential hazards. It’s also the right of the employee to receive information about health and safety laws that apply to your business. Welding exposes your workers to serious hazards, and accidents occur on a daily basis. However, providing safety training to your employees will greatly reduce the potential for serious accidents that can lead to lawsuits and high compensation expenses. Apart from expenses that you will incur in fines, litigation costs, and compensation payments, injuries can increase medical expenses including hospital, ambulance, doctor fees, rehabilitation, and medication. Your insurance premium can also increase as a result. Accidents also result in indirect costs such as lost productivity, disrupted work schedules, hiring, clean-up, and repair. Organizing a safety-training program for your workers is a noteworthy investment. Just like your customers, when you treat your employees well, they will stay, and when you value them, they will value your customers. According to Harvard Business Review (HBR) most employees remain at their place of work because they feel valued. Interested in More Welding Safety Training for your Workers? Welding is a hobby and a life-long job that doesn’t have to be dangerous. Make sure you invest in employee safety training and empower them to maximize their productivity. Get started by Contacting NTT Training today and register for the welding principles and procedures seminar.